The Virtual Book Club for Kids is back for April! 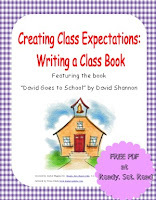 This month's featured author is David Shannon. David Shannon is a children's author of picture books that are great for preschool and early reader. Many of his picture books that can be used with older elementary grades. (Clicking on the pictures of the books in this post will take you to the book on Amazon. These are affiliate links). David Shannon is a well known author. You may know his popular character "David" who is featured in the Caledcott honor book, "No David"
We explored another popular book about David last fall when my son was headed to school. We read the book, "David goes to school" and we wrote our own "Yes, Logan" book to discuss all of the things he could do at school. Click on the picture to get the free printable activity based on David Goes to School. According to Scholastic's biography of David Shannon, the character "David" is based on the author and he first wrote the book when he was a young boy -- those were the only words he knew how to write! There are several other books by David Shannon that feature David as well. David is always getting into trouble. My boys like that! Shannon not only wrote books based on his own childhood, he also wrote, "Good Boy, Fergus" based on his dog, Fergus. Preschoolers will love this book because it is based on a dog that is just a mischievous as most preschoolers. Another mischievous character in David Shannon's books is Alice. You can read all about her in Alice the Fairy. Another great book by David Shannon for preschool through early reader is Duck on a Bike. This book features a repetitive text and animal sounds-- perfect for preschoolers. Plus, it's silly. Many of David Shannon's books can be enjoyed with older readers as well. They are great read alouds for upper elementary grades. A Bad Case of the Stripes deals with issues of upper elementary grade students. This book features a girl who is so worried about what other people think of her so breaks out in a bad case of the stripes. The reading level of the book might work for younger children, but it seems that the themes of the book are much better understood by older elementary children. The book I'll be featuring this month for the virtual book club for kids is Too Many Toys. Come back April 15th for my full review and a fun, easy, and cheap activity to accompany the book! Are you participating in the Virtual Book Club for Kids this month? Which David Shannon book will you choose? One that I've reviewed or a different title? 1. 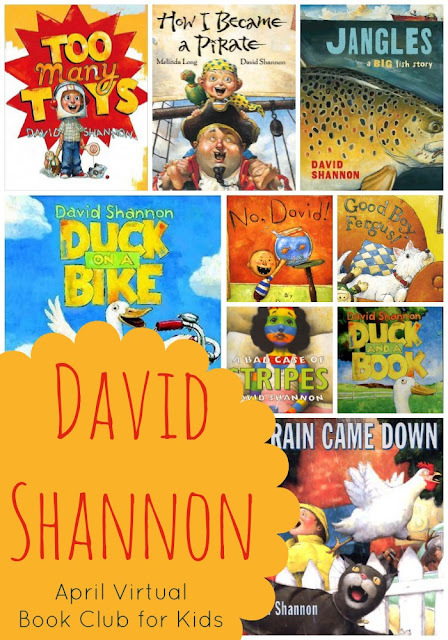 Choose a David Shannon book to share with your children or your class. 2. Create an activity based on the book to share. 3. Come back April 15th to share your idea, see what I have to share, and check out all of the great ideas that are linked up. The linky will be open for 3 weeks! Here are some of the other bloggers who will be participating. I love David Shannon books. What a great round up of his books and activies! I am thinking of doing Too Many Toys too! I love Duck on a Bike. Will be fun to see what everyone comes up with for the Virtual Book Club. Thanks for sharing at The Children's Bookshelf!